(MoneyWatch) When U.S. Department of Homeland Security Secretary Janet Napolitano said this week that the sequester had already caused lines at airports to get longer, her apparent exaggerations set off a storm of criticism. Yet air travel advocates are indeed warning that delays and other travel problems will grow much worse because of the cuts in Transportation Security Administration and other government spending that took effect March 1. And they are furious about one part of the puzzle in particular: Every time passengers fly, they pay significant fees meant to fund everything from customs inspections to TSA pat-downs. Those hefty fees are intended to make the agency self-funded, and they should insulate the TSA from the kind of sharp drop in funding that would require it to suddenly curtail security checks and other service. "Our fees have not been have not been cut one penny, yet we're being threatened with draconian cuts," said Charlie Leocha, the director of the Consumer Travel Alliance, an advocacy group focused on airline travel. Nearly 80 percent of the flying-related costs incurred by the Federal Aviation Administration and DHS are funded by by travel taxes and fees, according to the Consumer Travel Alliance. In 2012, passenger taxes generated $3.8 billion for DHS, with the money funding TSA security and customs and immigration controls. As an example of the heavy fees travelers face, Leocha cited a litany of charges found at the end of one airline ticket from Austin to Washington D.C. -- an excise tax of $77.50, security fee of $5 and facility fee of $9, among others. Those payments are collected by the IRS and distributed to different government agencies. Additional taxes and fees are tacked on for international travel, including separate $17.20 charges for airport arrivals and departures, $7 immigration user fee, and $5 plant and animal inspection fee. Because the fees passengers pay are a separate source of funding from government funding, travelers shouldn't be penalized by sequester cuts, Leocha said. "This [budget mess] shouldn't be our problem." Geoff Freeman, chief operating officer of the U.S. Travel Association, an advocacy organization supported by travel industry players, agreed that air travelers already bear the brunt of fees to pay for security, and like other activists he is angry that many of those fees are diverted to uses other than airport safety. He noted that about half of the money used to fund land security at the country's borders is collected at airports. "For years those fees have been diverted," he said. "Yet now, we're seeing cuts in overtime for [Department of Homeland Security] workers. That's how the agency manages peak times." For the 2013 fiscal year, the Obama administration has proposed collecting $2.2 billion in passenger fees, an increase of $317 million. Of that, $117 million would be used to further offset the cost of aviation security operations and $200 million would contribute to federal deficit reduction. In its budget, the Homeland Security Department notes that there have been no increases in the security fee since 2002, but that costs have risen 400 percent. Homeland Security's description of the fees gives credence to Leocha's argument that airport security shouldn't be touched since it is a self-funded operation, akin to the argument that Social Security shouldn't be touched because it has nothing to do with the federal budget deficit. "The administration's proposal makes progress toward fulfilling the intent of the Aviation and Transportation Security Act to cover the costs of aviation security through fees and not by the general taxpayers," DHS's latest budget says. Freeman noted that overtime pay cuts for airport security personnel are happening now, as is the hiring freeze, which is essentially a manpower cut since people who leave their jobs aren't going to be replaced. But it is unclear why overtime cuts should be debilitating for the TSA. Altering work shifts for airport screeners should be able to compensate for peak travel times. experts said. "TSA is definitely not short-staffed," said Christopher Elliott, co-founder of the Consumer Travel Alliance. "With a budget of around $8 billion, it's a huge, top-heavy organization. They should be able to handle the screening of passengers, even during a sequester, without any problems." A TSA spokesman was unavailable for comment Wednesday. Freeman and others expressed concern that while the federal spending cuts are indiscriminate, air travelers will bear the brunt of the suffering as political leaders ratchet up the pressure to end the sequester. "Travel is already a process that's too full of hassle, " he said. "We're worried that it's going to get worse. It's looking more and more that travel will be the public face of the sequester. We can only hope that it's not being done for political purposes." One travel expert even cited rumors that the TSA might be deliberately slowing down airport lines in order to dramatize the impact of the sequester. Douglas Kidd, executive director of the National Association of Airline Passengers, said that the current focus on how the sequester will affect air travelers is analogous to how local officials, first target libraries and sports programs when faced with large budget cuts. But he said air travel is already suffering from the demeaning experiences passengers regularly face. 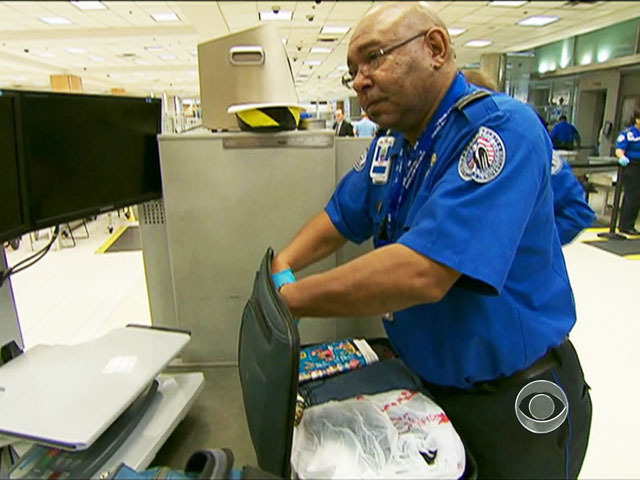 "There are a lot fewer people traveling anyway because of over-friendly pat downs by TSA screeners," he said.